Directed by Justin Lin and stars Lucas Black, Bow Wow, Nathalie Kelley, Brian Tee and Sung Kang. 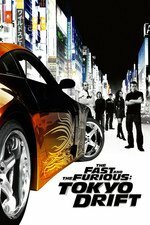 In defense of 'The Fast and the Furious: Tokyo Drift' which "suffer[s] some minor flaws - resorting to stereotypical Yakuza connections in a Japanese set film, and some weak CGI effects (crowds, not racing) but with this type of movie who really cares?" Not gonna lie, this is my favourite of the series. I have a ridiculous crush on Lucas Black. Like "I actually watch NCIS: New Orleans for him" levels, and nobody should stoop to that. It's just that cocky grin and that drawl and...yep. So you stick him behind the wheel being a dumbass, add the also incredibly awesome Sung Kang, a cameo from Sonny goddamn Chiba, a soundtrack with both the 5 6 7 8s' "Barracuda" and Shonen Knife's cover of "Top Of The World", and then get Justin Lin directing it? Hi, how's it going? You, uh, wanna come home and get in my DVD pile? I also adore the fact that Justin Lin decided that Sung Kang would play a character named Han, which was also the name of his character in Better Luck Tomorrow, also directed by Justin Lin. Which means that this director tied his little indie film into this great big franchise, and that delights me. Plus, now every time there's a boy racer running around town, I get to go "What is this, Fast & Furious Nottingham Drift?" because I am easily amused and the boy racers here are awful. Everything about this movie is great except for the lead white guy and the lead girl. Han is han, the bad guy is glorious and also conflicted, the car scenes are great, the black guy is entertaining. Lucas Black is way too old and acts like a piece of cardboard. Should have stuck some scrawny beanpole in there. I watched this recently (having not seen any of the other F&F movies), and thought it was big fun - better than I expected, actually. (Admittedly, my expectations were moderate at best.) Also, man, that end bit with Vin is the most homofabulous thing I've seen lately outside of Tom of Finland artwork. I watched this shortly after finishing watching the anime Initial D, which is all about street drift racing. So I was actually a little disappointed by the racing in this. I like how Lucas gets punished for being too badass by being sent to live in Japan. Oh noes! And he's clearly out of his depth because he doesn't know words like gaijin or yazuka, which I guess means he has never read a Frank Miller comic? I fully expect him to ask what a ninja is yet. And yet this movie is goofy and fun enough to put it above the last one, if not quite topping the first film. Everyone warned me about it as a series low, but I have to admit I'm quite fond of it. Especially Han Seoul-Oh, who lives up to his name. And then there's the cameo at the end... Come on, that's pretty cool. Artw: "because he doesn't know words like gaijin or yazuka"
You know, the Yazuka, the Japanese Magia. I will be the outlier and hate this movie and rank 2 Fast 2 Furious above it. Han is the best thing in this movie, followed by the soundtrack. But this is a "white kid learns foreign culture only to become the master" coming of age story ugggggh. There is no tension in the end race so it is boring as hell. Is it truly Fast or Furious? No, it is not. But the worst is over and the really good stuff can begin. I came into this one AFTER every other movie, and man, if not for Han, and that Dom cameo at the end, I wouldn't have considered it to be a F&F movie in the 'canon' sense. But I can see how this movie was intended to springboard a possible idea of having F&F as just the collective banner for a 'series' of racing movies. Too bad it didn't do very well, but lucky for us (me!) that it didn't otoh. I really liked Lin's direction, but this movie is too disposable for me. Well, except for the retroactive sads over Han's retconned post-Gisele funk. On the other hand, I *genuinely* appreciated having an Asian character who isn't magically fluent in another Asian language just because he's Asian. He's as much a foreigner as Lucas Black's character. It may be the most blatantly lady-prize-centric film in recent history, with multiple races where women are literally the prizes. Depending on who you see it that's either a mark against it or refreshingly honest naïveté. It is a barely canon movie, and yet. Racing vertically. I don't know, I sort of love this stupid movie. But I love all the fast/furious movies. So. This made me a true TFAF fan. I went to see it by myself, in a crowded theatre, during the loneliest period of my life. Fast & Furious movies are made to be watched with crowds, and the feeling of walking out of it remains one of my favourite movie memories ever. For a while, I had been part of something fun with other people. I know how pathetic it sounds. But, right then, it was damn close to perfect. Also, Bow Wow is a great entry in the Rappers of the Moment Appearing in Fast & Furious Movies tradition (which reached its nadir with 7's Iggy cameo). This is supremely superior to 2F2F - and actually serves as a great bridge to the blockbuster crime epic feel of the next three films. Katemonkey: Plus, now every time there's a boy racer running around town, I get to go "What is this, Fast & Furious Nottingham Drift?" because I am easily amused and the boy racers here are awful. My girlfriend and I actually made that exact same comment the other day, so you're definitely not alone in that sentiment.